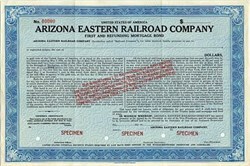 Beautifully engraved Specimen certificate from the Arizona Eastern Railroad Company. This historic document was printed by American Bank Note and has an ornate border around it. This is the first time we have had this certificate for sale. This railroad was a Southern Pacific branch that ran through Arizona.